"Light Up the Darkness" a Successful Event! Our brave service men and women have risked everything to keep us safe and sound. While we grieve for those who lost their lives, we must also support those who were injured in the line of duty. For our veterans who lost their eyesight in service to our country, the Blind Veterans Association (BVA) is there to provide support and allow them to live independently. The Blinded Veterans Association (BVA) is an organization of blinded veterans helping blinded veterans. Founded in 1945, BVA has been helping blinded vets ever since. Although chartered by the U.S. Congress, BVA receives no government funds. Instead we rely on the generosity of Americans like you to provide free programs and services to any blinded veteran of any conflict. Thank you for your support! The Veterans Service Resource Center is a one-stop shop for services provided by BVA, featuring a dedicated toll free number which any blind veteran across the nation can call and receive services from any BVA National Field Service Officer regardless of where they live. This streamlines services and provides consistency to all veterans. 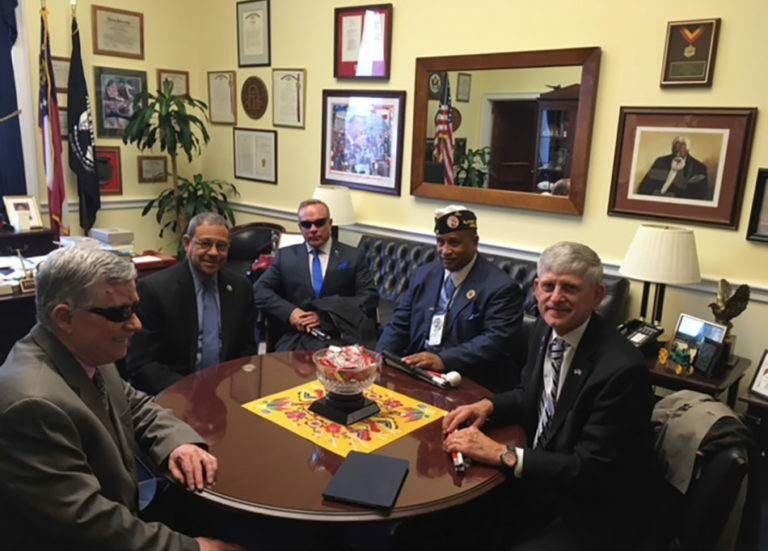 BVA employs government relations personnel who work with members of Congress, congressional staff, and government agencies including Veterans Administration to ensure that the needs of blinded veterans remain top-of-mind and, as appropriate, built into federal agency budgets. 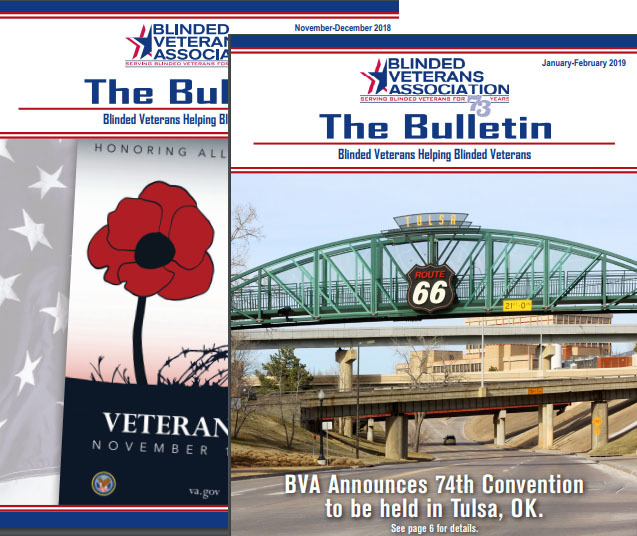 BVA Announces Tulsa as the 74th Convention Site: Blinded Veterans and their families may now begin planning to attend BVA’s 74th National Convention in Tulsa, OK. The five-day event will convene on Monday, August 12th, and culminate on Friday, August 16, 2019. To make your hotel reservations, please call Marriott Tulsa Southern Hills at 800-228-9290 and identify yourself as part of BVA’s event with code “BVA2019.” Information on registration and room rates will be available at a later date. For additional information, click the below read more button. A key component of BVA’s communications and public relations efforts is the BVA Bulletin, a printed periodical that is available in three additional formats and also accessible online in both print and on YouTube. The Bulletin focuses on issues and events relating to blinded veterans and also covers general topics about veterans and current issues affecting them. The publication strives to keep its audience abreast of services, benefits, and legislation. It also provides as much detail as possible on issues relating to blind rehabilitation and the blind and visually impaired communities at large. The Blinded Veterans Association mission is to operate as a not-for-profit corporation exclusively for charitable, educational, patriotic, and civic improvement purposes; to promote the welfare of blinded veterans so that, notwithstanding their disabilities, they may take their rightful place in the community and work with their fellow citizens toward the creation of a peaceful world; to preserve and strengthen a spirit of fellowship among blinded veterans so that they may give mutual aid and assistance to one another; and to maintain and extend the institutions of American freedom and to encourage loyalty to the Constitution and laws of the United States and of the States in which they reside. We will be there with encouragement and support, to ensure no blinded veteran is left behind. BVA traces its roots back to the end of World War II. The organization’s founders consisted of some 100 young men, mostly in their early 20s. Members of this unique group had recently lost their sight in the war and were recovering from their injuries at Avon Old Farms Army Convalescent Hospital near Avon, Connecticut. On March 28, 1945, the group held a meeting at the facility with the express purpose of forming an organization to help their fellow blinded veterans. Thirteen years later, BVA was chartered by the U.S. Congress to speak and write on behalf of blinded veterans in national legislative affairs. 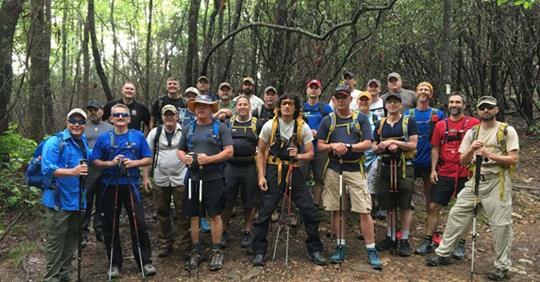 Ever since, BVA officers and staff have worked tirelessly to fulfill the Association’s mission and uphold the ideals expressed in its Congressional charter. Throughout BVA’s history, Congress and the now Department of Veterans Affairs (formerly the Veterans Administration) have recognized BVA as the exclusive voice for blinded veterans nationwide. 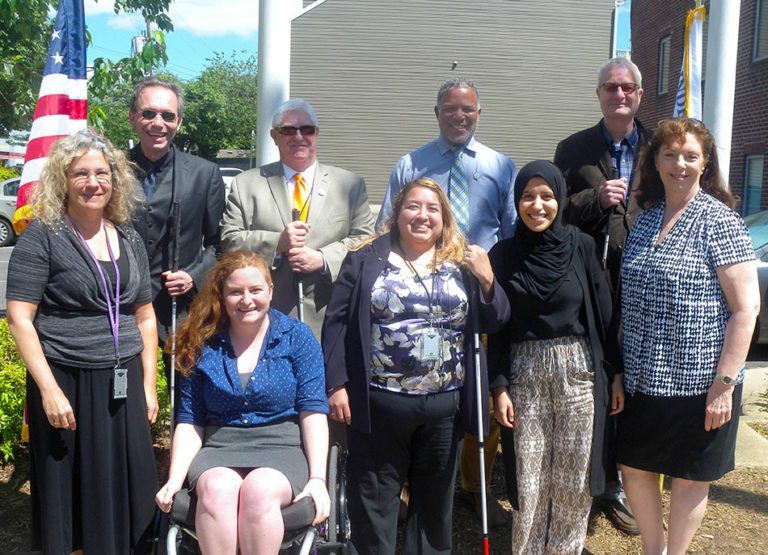 Read more about BVA’s historical achievements in advocating for blinded veterans and ensuring the VA delivers the services they need.